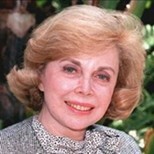 Joyce Brothers, PhD (maiden name Joyce Diane Bauer, born October 20, 1928) is one of United States' leading family psychologists and advice columnists, publishing a daily syndicated newspaper column since 1960. She gained fame in 1955 by winning The $64,000 Question game show, on which she appeared as an expert in the subject area of boxing. Dr. Brothers had a monthly column in Good Housekeeping magazine for almost four decades, was the host of her own television program, has published several best-selling books, and continues to appear on television, radio, and in film both as an expert in psychology and in comedic cameo appearances, including Mama's Family, The Naked Gun, The Nanny, Mickey Spillane's Mike Hammer, Married... with Children, The Simpsons, All That, Kenan & Kel, Frasier and Late Night with Conan O'Brien. She also appeared as an occasional celebrity guest on game shows such as Match Game, the 1968 revival of What's My Line? and Hollywood Squares. She earned her PhD in psychology from Columbia University after completing her undergraduate work at Cornell University, where she was a member of Sigma Delta Tau sorority.